We can make clock repairs & overhauls on almost any kind of clock - whether it has an antique or modern movement, it is electric or mechanical, or if its wooden, porcelain, or glass. We provide a 1 year warranty on repairs & parts. Clock movement overhauling involves taking the whole movement apart, replacing bushings and other worn parts, putting it back together and fully testing it for restored performance. If necessary, we have the skill & experience to make replacement parts for out-of-date mechanisms. 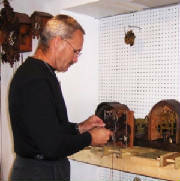 That's where our experience comes in....we take your clock and disassemble it. We inspect the bushings to determine if they have become misshapen causing the clock to no longer run appropriatly. Bad bushings are drilled out & replaced. We put your clock back together which requires our intimate knowledge of each type of clock that only proper experience can provide. We oil and adjust your clock. Oil helps to lubricate the bushings and pivots allowing the clock to run smoothly, reducing wear and extending the life of your clock. Lastly, your clock is tested to assure it is running accurately. 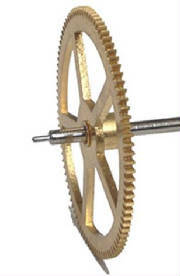 There are many pivots, bushings, gears and springs inside your clock. 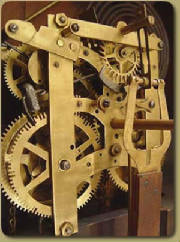 Mechanical clocks wear out because the clock is composed of MANY moving parts that move ALL DAY, EVERY DAY. Without routine maintenance, the clock simply wears out and stops working properly. We inspect and polish the pivots which rotate inside the bushings. Each gear and their teeth are inspected for broken or missing pieces. Contact us at (910) 443-7939 or djwilliams1212@yahoo.com for all of your clock, phonograph, and music box needs.